One of my former volunteer gigs was at the WRBH-Radio for the Blind on Magazine Street in Uptown New Orleans. On Sunday mornings, I would show up and grab a Spin or Time magazine or sometimes a kid's book and retreat to a soundproof booth and read to those across the region with vision impairments. transcription into Braille as summer business. I've since moved on to more interactive volunteer projects, but a recent email from past Louisiana Restaurant Association Chairman DickieBrennan made me realize again how truly fortunate we are to have the sense of sight. Brennan's cousin, Sophie Trist, is a 15-year-old blind student who is currently a rising sophomore at Mandeville High School. As she strives to learn the skills she will need to be a successful, independent adult, one hurdle she’s encountered is the lack of braille menus in restaurants. This prompted her to take action and start a summer business of providing as many local restaurants as possible with a braille menu. For a small fee of $20, she will take a copy of a restaurant menu and in return provide the restaurant with a braille copy. Trist can be contacted via email at sweetpeareader@gmail.com. Include the name of the restaurant, contact information and any other specifics of your order. An estimated 10 million American's have some sort of visual impairments and chances are your restaurant has fed a few of them. What do you do when this happens? Does your server offer to read the menu or does the visually impaired diner rely on their companion (if they have one)? Having a braille menu on hand provides restaurants with an efficient way to serve the visually-impaired diner. It also allows your customer to feel empowered and comfortable in your establishment and in turn, you could gain a repeat customer. Although the American with Disabilities Act doesn’t require restaurants to offer blind patrons a braille menu if a staff member or server is available to read it to them, it’s still a great amenity to offer. 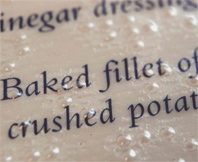 Do you have a braille menu on hand for your visually-impaired customers? How do you handle it if you do not? Sophie Trist is truly an amazing and inspiring young woman. She is a rising star and a force to be reckoned with. I am sure that this world will be hearing from this gifted young lady as she makes her mark. What a wonderful young woman. God Bless you Sophie. 67 days until we meet in New Orleans for EXPO!